An incomplete copper alloy ornamental cross-staff head mount. The spherical head has an openwork design decorated with five surviving knops. One complete sub-oval hole survives with an internal length of 5.11mm and width of 3.93mm. The broken edges are rough and crude. Projecting from the base of the object is an integrally cast hollow cylindrical expanded collar or shaft. This measures 18.62mm in height and is 19.05mm in diameter at its centre. The base of the shaft and where it joins the body of the object thickens forming a circumferential collar. The shaft contains four holes probably for attachment. Two of the holes, (one opposite the other) are just above the lower collar and are empty. They measure 3.87mm in diameter. The other pair of holes (one opposite the other) on the opposite faces are infilled with corrosion, but possibly are incomplete. The base of this pair is 7.90mm above the lower collar and they measure 3.14mm in diameter. The object has a mid-green patina and is corroded in places. Similar examples have been found, mostly notably two artefacts in the Warwickshire Museum collections, found at Wellesbourne and Wixford. 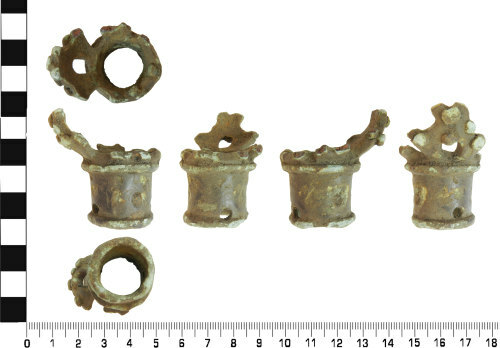 The Wellesbourne example is particularly similar and is illustrated in an article written by Simon Bailey, 'Two Copper Alloy Cross-Staff Heads from Warwickshire', in Medieval Archaeology 38 (1994) pages 171-5, fig 3. It has been noted by Bailey that further examples have been found at Dublin, Canterbury, London, Nottingham and Cambridgeshire. The Dublin example was dated to the mid 11th century (c.1020-30) by its archaeological context. The Canterbury example was dated to the end of the 11th century, (GLO-B49841). A similar example which can be found on the database is, GLO-B49841 https://finds.org.uk/database/artefacts/record/id/495302. Also see BERK-3E9328 HAMP-8C67D6 CAM-64F318 for similar examples.